Robert Patrick "Rocky" Bleier (ˈblaɪər, BLAI-yer, born March 5, 1946) is an American former professional American football player. He was a National Football League (NFL) halfback for the Pittsburgh Steelers in 1968 and from 1970 to 1980. Nicknamed "Rocky" as a baby, Bleier said, "As the first born of the family, my dad was proud, as all parents are. And the guys would come into the bar and say 'Bob, how's that new kid of yours?' And my dad would go, 'Aw, you should see him, guys, looks like a little rock sitting in that crib. He's got all these muscles.' So they'd come back in the bar and they'd say, 'Hey Bob, how's that little rock of yours?' So after that, that's how I got it. It stuck." Born and raised in Appleton, Wisconsin, Bleier was the oldest of four children of Bob and Ellen Bleier, who ran a tavern - Bleier's Bar - while the family of six lived above it. He had a paper route as a youth, and graduated from Xavier High School in 1964, where he starred in football and basketball. In football, Bleier was a three-time all-state selection as running back, and won all-conference honors at both linebacker and defensive back. He was a team captain in football, basketball, and track. After his rookie season with the Steelers, Bleier was drafted into the U.S. Army on December 4, 1968, during the Vietnam War. He volunteered for duty in South Vietnam and shipped out for Vietnam in May 1969 assigned to Company C, 4th Battalion (Light), 31st Infantry 196th Light Infantry Brigade and assigned as a squad grenadier operating a 40mm M79 grenade launcher. On August 20, while on patrol in Hiep Duc, Bleier was wounded in the left thigh by an enemy rifle bullet when his platoon was ambushed in a rice paddy. While he was down, an enemy grenade landed nearby after bouncing off a fellow soldier, sending shrapnel into his lower right leg. He lost part of his right foot in the blast as well. He was later awarded the Bronze Star and Purple Heart. His rank was Specialist 4. While he was recovering in a hospital in Tokyo, doctors told him that he could not play football again. Soon after, he received a postcard from Steelers owner Art Rooney which read "Rock - the team's not doing well. We need you. Art Rooney". Bleier later said, "When you have somebody take the time and interest to send you a postcard, something that they didn't have to do, you have a special place for those kinds of people". After several surgeries, he was discharged from the military on August 20, 1969, and began informal workouts with Steeler teammates. Bleier rejoined the Steelers in camp in 1970. Upon his return, he couldn't walk without being in pain, and weighed only 180 pounds (82 kg). He was put on injured reserve for the season, but returned in 1971 and played on special teams. He spent several seasons trying to get increased playing time, and was waived on two occasions. But Bleier never gave up, and said that he worked hard so that "some time in the future you didn't have to ask yourself 'what if?'". An offseason training regimen brought Bleier back to 212 lb (96 kg) in the summer of 1974, and he earned a spot in the Steelers' starting lineup. In addition to being a great lead blocker, Bleier was the second of the Steelers' rushing weapons (Franco Harris was the primary back), but was effective nonetheless at both blocking and rushing. In 1976, both Harris and Bleier rushed for over 1,000 yards, making this the second NFL team to accomplish this feat, after Mercury Morris and Larry Csonka of the 1972 Miami Dolphins. Bleier played in the first four Steeler Super Bowl victories, and caught the touchdown pass from Terry Bradshaw that gave Pittsburgh a lead it would never surrender in Super Bowl XIII. He also recovered Dallas's onside kick in the closing seconds, sealing the Steelers' victory. Bleier retired after the 1980 season with 3,865 rushing yards, 136 receptions for 1,294 yards, and 25 touchdowns. At the time of his retirement, he was the Steelers' fourth all-time leading rusher. Bleier signs an autograph at the North Dakota National Guard's 2009 Safety Conference in Bismarck. Bleier wrote a book of his struggle to recover from his war wounds called Fighting Back: The Rocky Bleier Story, and it was made into a television movie in 1980, with Robert Urich starring as Bleier, Richard Herd as Steelers coach Chuck Noll, Art Carney as team owner Art Rooney, and many of Bleier's teammates (including Matt Bahr and "Mean Joe" Greene) as themselves. Bleier is featured in the 2014 feature documentary "Project 22", which chronicles the cross-country motorcycle journey of two young veterans exploring alternative treatments for PTSD and TBI. Bleier has four children. He has two children from his marriage with Aleta Giacobine Whitaker, from whom he was divorced in October 1996. He also has two adopted children with his second wife, Jan Gyurina. As of 2011, he lived in Mt. Lebanon, Pennsylvania. Bleier has become an author and speaker on retirement and financial management. He has authored the book Don't fumble your retirement and is the co-host of a weekly radio show The Rock on Retirement on Pittsburgh radio station 104.7 FM WPGB. He runs Bleier Zagula Financial with his business partner Matt Zagula. The football stadium at Xavier High School was renamed Rocky Bleier Field on the Knights of Columbus Sports Complex on October 12, 2007. Bleier tossed the coin to start the high school football game that day. He had spoken earlier in the day to students at an assembly. The entire student body wore T-shirts with his number 23, the only number retired in the school's history. On the following day, the third day of a three-day event, mayor Tim Hanna unveiled a street named in his honor. The former Oneida Court was renamed Rocky Bleier Run. 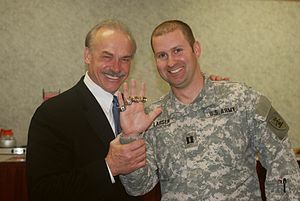 ^ a b "Biography for Rocky Bleier". The Internet Movie Database. Retrieved August 21, 2009. ^ a b c Mike, Woods (October 13, 2007). "Xavier teaches importance of history with Rocky Bleier". The Post Crescent. ^ "Bleier to hang 'em up? His mom hopes yea". Gadsden Times. Alabama. Associated Press. January 16, 1980. p. 18. ^ Telander, Rick (August 11, 1986). "Local boy makes good". Sports Illustrated. p. 62. ^ O'Brien, Jim (December 19, 1980). "Bleier delivers in any weather". Pittsburgh Press. p. B-14. ^ "Bleier, Appleton Xavier star, top back for second year". Milwaukee Journal. December 3, 1963. p. 19, part 2. ^ a b "Captaincy is a habit with Irish star". Milwaukee Journal. September 8, 1967. p. 20. ^ a b Hansen, Eric (2005). Notre Dame: Where Have You Gone?. Champaign, IL: Sports Publishing LLC. p. 7. ISBN 1-58261-151-3. Retrieved April 7, 2010. ^ "Bleier wounded in Vietnam". Pittsburgh Post-Gazette. Associated Press. August 29, 1969. p. 16. ^ Bleier, Rocky; O'Neil, Terry (June 9, 1975). "June 9, 1975". Sports Illustrated. p. 76. ^ Donovan, Dan (July 26, 1970). "Bleier runs long road". Pittsburgh Press. p. 7, section 4. ^ "Bleier not asking for any favors". Lewiston Daily Sun. Maine. Associated Press. August 3, 1970. p. 12. ^ a b Bechtel, Sam (July 25, 1973). "They got a piece of the Rock...but not enough". Beaver County Times. Pennsylvania. p. D-1. ^ "Fighting Back (1980) (TV)". The Internet Movie Database. Retrieved August 21, 2009. ^ Walsh, Lawrence (January 3, 1997). "Divorce leads Bleier to sell 4 Super Bowl rings in bankruptcy". Pittsburgh Post-Gazette. p. A-1. ^ Pitz, Marylynne (January 8, 1997). "Bleier lists debt figures to explain bankruptcy". Pittsburgh Post-Gazette. p. C-1. ^ Robinson, Alan (January 24, 1997). "Bleier: From bars to Super Bowls to bankruptcy". Daily Gazette. Schenectady, New York. Associated Press. p. 18, Super Bowl XXXI. ^ Bleier, Rocky (2011). Don't Fumble Your Retirement. Charleston, SC: Advantage. ISBN 978-1-59932-290-2. ^ "Rocky Bleier and Son, Adri Bleier, Form Bleier Zagula Financial to Help Safeguard Pittsburgh Area Retirees". PR.com. Retrieved July 17, 2018. Wikimedia Commons has media related to Rocky Bleier.